You are here:Home » Blog » Locals Guide to Byron Bay » Broken Head takes home finalist award! The CCIA Awards of Excellence is an important annual event for the caravan park industry. The Awards of Excellence honours the success of caravan and camping trade businesses along with holiday parks throughout New South Wales. This is the first year we have nominated the Broken Head Holiday Park for such a prestigious award and we are delighted that we have come out as a finalist. This is a great achievement for us and is a great way to prove that we are one of the best on the East Coast! 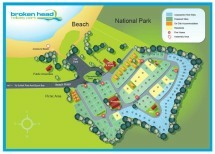 Broken Head Holiday Park- 2011 Finalist in the CCIA Awards of Excellence! !